Lizards are reptiles with over-lapping scales. They also have moveable quadrate bones that allow them to open their mouths very wide. Finally most lizards (but not all) have legs, which distinguishes them from the snakes. Lizards also have the ability to drop their tails if they are attacked by a predator. You can see the discolored area of the tail where this one has just grown its tail back. There are many different kinds of lizards, such as Gila monsters, horned lizards and western whiptails. Find some books or identification guides and learn about the different kinds. For example, Get to Know Gila Monsters by Flora Brett is for young readers. 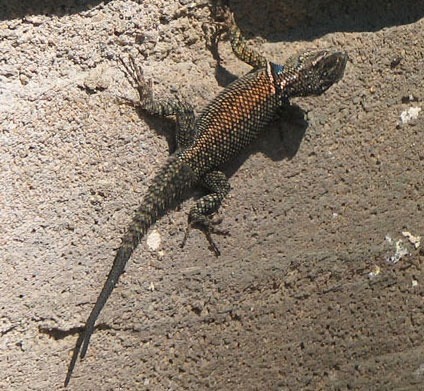 Western fence lizards can be found climbing on trees, where they lend in perfectly with the bark, as well as on fences. The males have bright blue bellies, which they show off by doing push-ups. Lizards and other reptiles are ectothermic, which means that their internal body temperature is controlled by the temperature of the environment around them. Another word for this is “cold-blooded,” although lizard don’t really have cold blood. 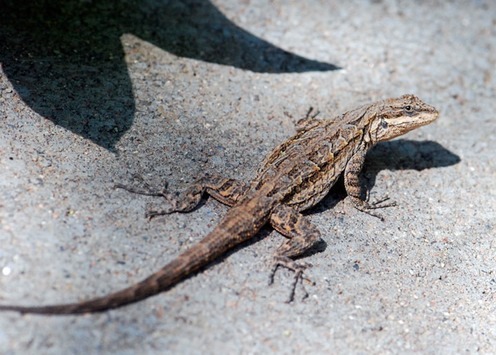 Lizards move from sun to shade and place to place to keep their temperature in the optimal range. Place a similar amount of sand into each container. Moisten the sand in one of the containers with water. Set both containers in the shade or indoors with the lamp off for a a few minutes to allow it to stabilize. Now take the temperature of the sand just under the surface with the thermometer for both containers and record the results. Move the containers to a sunny place or under a lamp. Take the temperature after five minutes and again after ten minutes. Did it change? How did the temperature of the wet sand change in comparison to the dry sand? (The temperature of the wet sand should change less than dry sand). If outdoors, encourage the children to check and record temperatures in several locations, both in the shade and in the sun. If you were a lizard that should have an internal temperature about 80 °F, where would you spend your time? How about if your preferred temperature was 90°F? What do lizards do when it is too cold out? Our Arizona lizards hibernate during the coldest months of the year.